Sometimes, your routine house cleaning just isn’t enough. There are always tasks and cleaning chores that force us to go beyond the weekly cleanup, especially when you have a special event coming up. The Maids understands this, and has made every effort to accommodate your needs, regardless of the chore or time you need us. We can help prepare your home for guests and parties by taking care of the cleaning. We are capable of providing you with a wide array of one-time house cleaning services. From window cleaning to move-in and move-out services, we’ll take care of your occasional cleaning projects. So whether you need us for one event or you want a reliable cleaning service you can turn to throughout the year, The Maids in Ashburn, VA, is the one to call. Need a last-minute housekeeping service? We’ve got you covered. 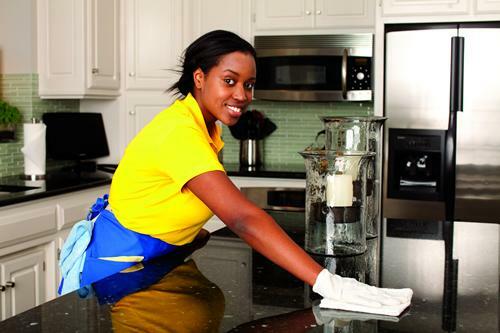 We have multiple teams of Maids, so we’re able to help get your home clean on short notice. Whether something came up at the last minute, or you simply have too much to do before a big event at your house, call The Maids to come do the same-day house cleaning for you. Our teams arrive on time and with all the proper cleaning supplies, so there’s nothing you need to worry about. We use environmentally friendly cleaning products and high-tech equipment to get your house in tip-top shape before your guests arrive. Everyone will be thoroughly impressed with how clean your house is—and we’ll let you take all the credit. If you are moving out of your old house in Ashburn, one of the items on your to-do list is one last thorough cleaning of the empty house or apartment. Perhaps the landlord or new owners requested that the place is spotless before you are officially moved out. But with packing and moving on your mind, you probably forgot to leave your cleaning supplies out. Rather than stress about cleaning before you move out, The Maids can take care of this one-time chore, giving you peace of mind during your move. On the other hand, if you’re moving into a new home, we can also do a thorough clean before you are settled in your new place. Who knows what germs or dirt could be lingering from past tenants? The Maids provide detailed move-in cleaning for your convenience. We’ll make sure your new place is clean, healthy and ready for you to make it your home. With difficult chores like these that only need to be done once every so often, the help of a professional may be required. Don’t spend your weekend in Ashburn trying to catch up on all these occasional cleaning projects; call The Maids to get them done for you. When you’re looking for a maid service to take care of your occasional cleaning needs in Ashburn, VA, The Maids can get the job done. Call today to schedule your one-time house cleaning service!